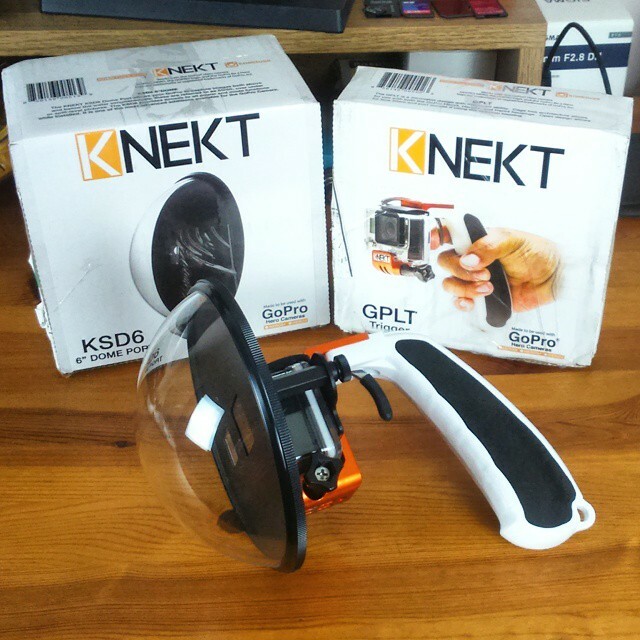 I’ve managed to get my hands on a KSD6 dome port from KNEKT, it’s designed to shoot over/under style photos using your GoPro camera. There’s a couple of mistakes in the video, I describe how useful the water guide line is on the back of the port and say that the water line will curve instead of being flat, but I got it the wrong way around. When you shoot with a fisheye on land, say skateboarding for instance, the horizon does bend in the way I describe, but weirdly, because of the way the water curves around the dome the effect is reversed when shooting over/under style shots. I also said that I hadn’t used it in the sea, well even though the weather and waves were crap I had a quick go anyway, as you can see in the video. I got a few test shots with it and it worked as expected, I’m looking forward to really putting it through it’s paces when the waves and weather get better. This image from Luc Miousse is the only one I can find showing the latest control system for the SPL dome housing, I’d recommend contacting SPL if you want to find out more as they haven’t updated their website with information about this yet. Luc Miousse commented on one of my other Youtube videos and pointed out that the SPL Dome Port set-up does now have controls for the front button, even when used with the dome port, although it says the opposite on the SPL website. There’s also no way to buy on-line from SPL, you have to e-mail before hand, so I guess this feature would be pointed out at that stage. The newer style housing also has a window on the back so you can see the LCD screen, this is also going to allow better WiFi connectivity I think, so it’s quite an improvement over the original version that I used. It’s a shame there’s not much information on the SPL website to let people know about these updates. Should You Order The KSD6 GoPro Dome? Yes, unless you enjoy making stuff like this yourself, you will not find a better made GoPro dome and the price ($300) represents good value for something that offers a unique style of shot. Thanks for the reviews of the SPL and Knekt dome ports, I was wondering if you saw a difference in image quality between the two? It looks like as the SPL has its own housing and does not use the go pro housing, so you would be only shooting through the dome housing. Where the Knekt you are shooting through the gopro housing and the dome port. Does this make any noticeable difference? The quality of the domes will come in to play as well as well as the size, I think the SPL is 5”and the Knekt is 6″. So any indication of differences in the final image would be really appreciated! I haven’t done any detailed comparisons between the image shot using both domes, I don’t see how it would matter really, if you let me know what the images are going to be used for I can suggest the best option for you if you like. If I’m honest I don’t really worry about the image quality when shooting with my GoPro, it’s a really good fun camera to use and you can get great results, but the resolution is 12 MP and it only shoots in jpeg, so any differences in image quality between these two domes will be hard to discern I expect. Without doing some pixel peeping in lightroom I can’t tell you if there’s a difference between the two but I can tell you they are both going to give you very good results, they look great on Instagram and full screen on my computer. For video (even 4K) any differences in image quality aren’t going to be noticeable when watching surf footage, there’s simply too much going on for it to make any difference. The 6″ Knekt dome doesn’t use a full hemisphere (the 5″ SPL does), and that will result in a difference in angle of view underwater (I’m pretty sure) and how far away the dome is from the GoPro, so it will make a bit of a difference, but honestly, I don’t think it’s worth worrying about. For any application where image quality is the main priority (for a large print maybe?) I wouldn’t use a GoPro, there are many alternatives that would give you much, much better still image quality than a GoPro, my Sony a6000 and Samyang fisheye will instantly give me twice the resolution and the flexibility of shooting in raw for instance. I’d think about what the end result is going to be, if it’s just publishing photos or video on-line (99% of GoPro users) then relative image quality isn’t a concern, if it’s for still photo’s that are going to published on real paper then I would recommend getting a different camera. You might have a use case I haven’t thought of where image quality is a priority and a real stills camera isn’t a better option than a GoPro, but I can’t think of one right now. Question for you, if my main goal is to shoot video (both above and underwater while in the lineup), do you think it’s important to have a dome? Is the primary use of the dome to get 50/50 photo shots, or does the dome actually improve underwater photo/videography? I would assume above water the extra surface area is actually a liability given the potential for more water spots to collect? The primary use for the dome is definitely 50/50 style shots, but it does also increase the field of view when shooting underwater. 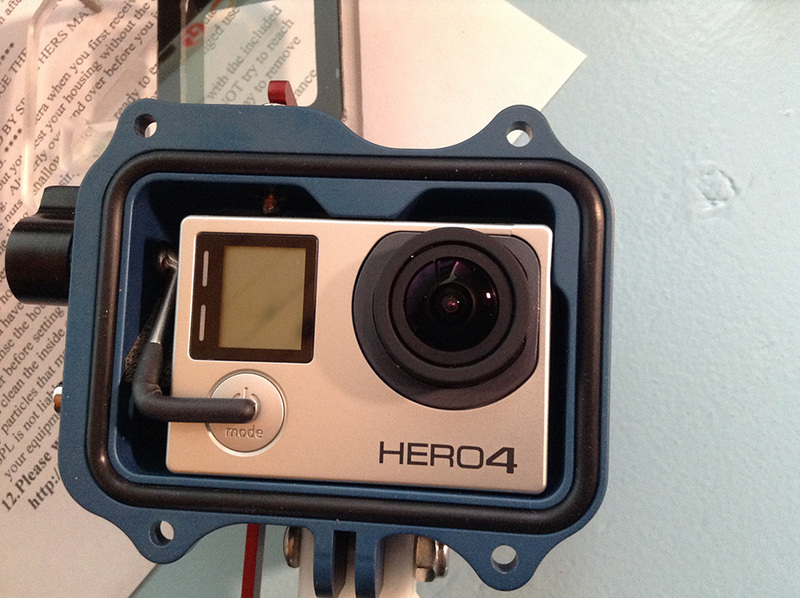 It will certainly be harder to keep drop free than the bare GoPro housing above water. So, I’d go for it if you want to get 50/50 shots or if you really need the widest field of view underwater, but otherwise it’s not going to make a huge difference I’d say. Hi! I can use the dome for a gopro hero plus + lcd? Yes, it’s got the same style of housing as the hero 4 cameras so it should work fine. It’s​ worth double checking with KNEKT before ordering, but I’m pretty sure.